puzzles should be locked away inside a padded cell. 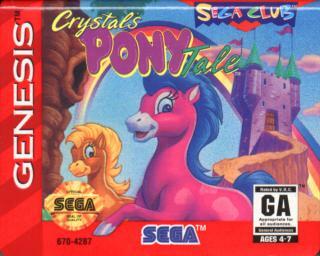 Otherwise, it's your typical platformer. See: Barney. Very good gameplay, for kids. Very annoying and boring for adults. And the sounds, ughhhhhhhhhhh!!!! This game has to be one of the best games i have ever played! 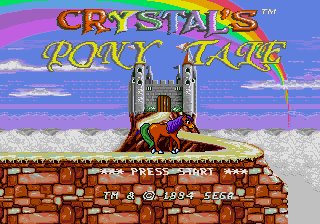 The graphics are great, the music is wonderful, and there are so many adventures.......boy was i suprised at the end, when i took rainbow road to mystical magical pony castle, i give this game a 9.5 out of 10, i am 16 years old, this is grade A material. i spend hours everyday playing this. 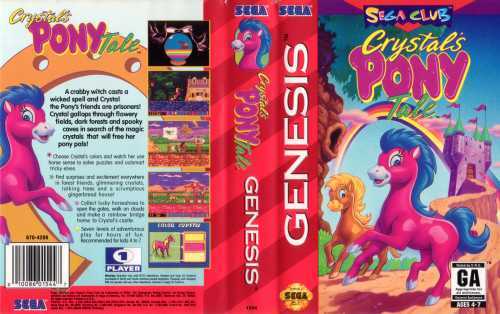 Crystal's Pony Tale is one of the best Sega games I have ever played, because it isn't too hard or outrageously simple. The graphics are beautiful, as are the BGM's. 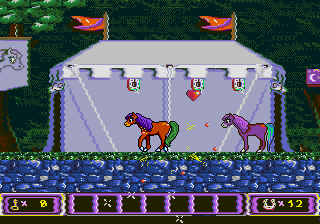 The music is based on piano classics. I agree that the pictograms are a little too much, though. But choosing your own pony's color is the best!! I beat this game after a few goes and (cough) though I thought that it was quite good actually I couldn't see myself going back to it much.